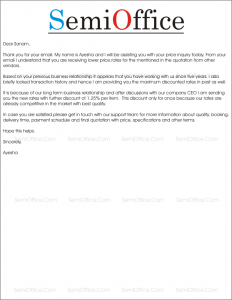 Quotation Letter Sample in Word to send quotations of product, services with prices and discounts. Thank you for your email. My name is Ayesha and I will be assisting you with your price inquiry today. 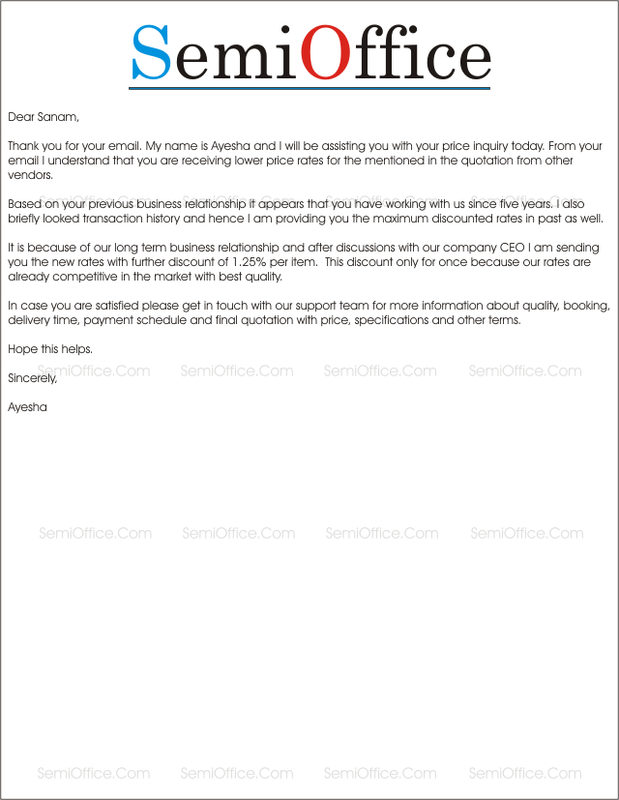 From your email I understand that you are receiving lower price rates for the mentioned in the quotation from other vendors. Based on your previous business relationship it appears that you have working with us since five years. I also briefly looked transaction history and hence I am providing you the maximum discounted rates in past as well. It is because of our long term business relationship and after discussions with our company CEO I am sending you the new rates with further discount of 1.25% per item. This discount only for once because our rates are already competitive in the market with best quality. In case you are satisfied please get in touch with our support team for more information about quality, booking, delivery time, payment schedule and final quotation with price, specifications and other terms.